Just like water turns to ice when the temperature drops, exposed skin can also freeze and soon you may suffer from frostbite. Frostbite occurs when skin and the underlying tissues freeze. In extreme cases, muscles, nerves and blood vessels may also freeze. Frostbite usually occurs on the toes, nose, cheeks, ears and chin. While the most common cause of frostbite is exposure to cold-weather conditions, it can also occur after direct contact with ice, freezing metals or very cold liquids. The risk of developing frostbite increases as air temperature falls below 5° F (minus 15° C), even with low wind speeds. With a wind chill of minus 16.6° F (minus 27° C), frostbite can occur in less than 30 minutes. People suffering from medical conditions that affect their ability to feel or respond to cold, such as dehydration, exhaustion, diabetes and poor blood flow in the limbs, are at a higher risk. The risk is also greater for people who drink or smoke a lot, have a history of previous frostbite or cold injuries, and who are in an area at a high altitude, which reduces the oxygen supply to the skin. The signs and symptoms of frostbite depend on the extent and depth of tissue injury. In the case of superficial frostbite, you may experience symptoms like pain, burning, tingling, numbness, pale skin, clear-colored skin blisters and firm-feeling skin with soft underlying tissue that can move over bony ridges. As the degree of injury progresses to involve deeper tissue structures, the signs and symptoms may include complete loss of sensation, formation of blood-filled skin blisters, and skin and underlying tissue that feels hard and solid. In no way should you take frostbite lightly. Complications can include increased sensitivity to cold, long-term numbness in the affected area, frostbite arthritis, growth defects in children (if frostbite damages a bone’s growth plate), infection, tetanus and gangrene, to name a few. Frostbite requires careful attention to minimize damage and reduce the likelihood of developing hypothermia. Hypothermia occurs when your body can’t produce enough heat to protect itself from the cold. If hypothermia occurs, treat that before the frostbite. While frostbite is painful, you can treat the problem at home with some simple and effective home remedies and lifestyle changes. 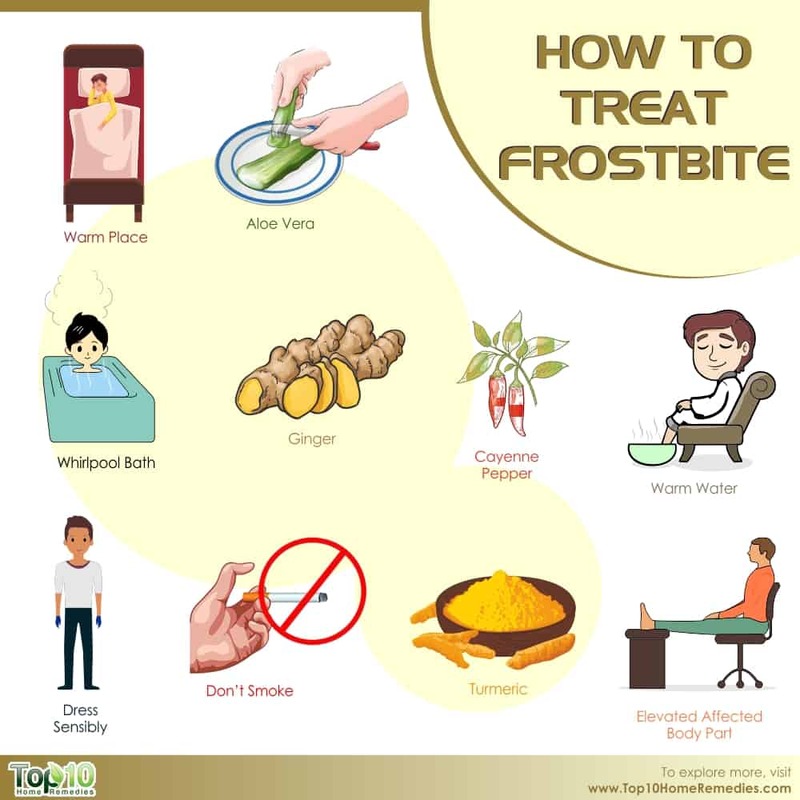 Here are the top 10 ways to treat frostbite. 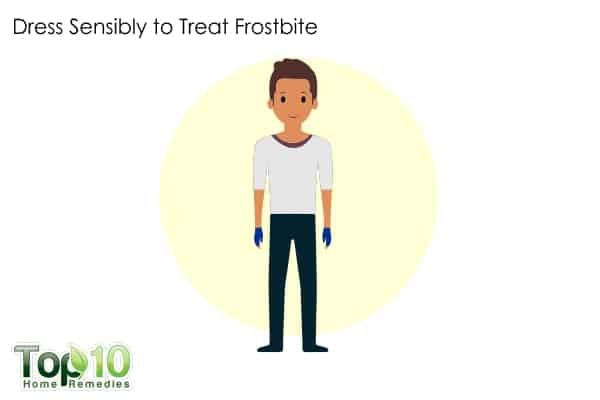 The first line of treatment for frostbite is to get out of the cold as soon as possible and take shelter in a warm place. The sooner you can do this, the more likely you are to have full recovery and prevent further damage. To protect an area like your feet from further cold, remove your shoes and socks and place a warm blanket on your feet. If you’re outside, you can warm frostbitten hands by tucking them into your armpits. Further, protect your face, nose and ears by covering them with dry, gloved hands. To prevent future incidents of frostbite, limit your time outdoors in very cold weather, especially if it is windy or wet. Always pay attention to weather forecasts and wind chill readings before going out. In very cold, windy weather, exposed skin can develop frostbite in a matter of minutes. 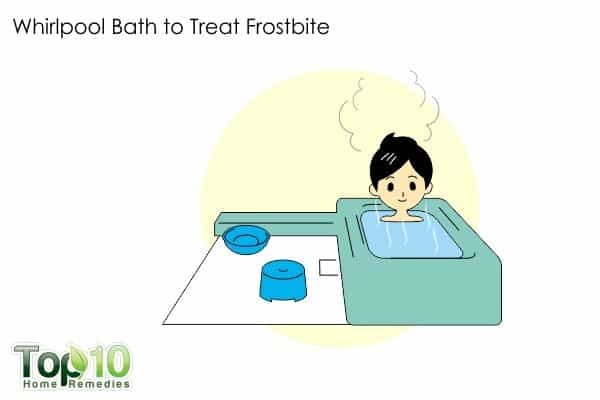 To treat frostbite, remove the source of the cold and slowly warm the affected skin by soaking it in warm water to bring it back to its normal temperature. A warm water soak will help increase the blood supply to the numb area. Moreover, it will relax the muscles and nerves in the area. 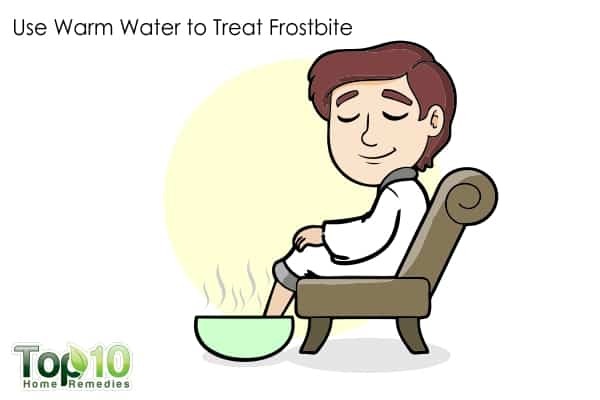 A 2010 study reports that the best immediate treatment for hands and feet is placing them in warm water at 40° to 41°C (104° to 107°F) for at least 30 minutes (1). Fill a small tub with warm water. The temperature should not exceed 104° to 107° degrees F.
Soak the affected area in warm water for 20 minutes. Repeat the soaking process if needed, taking 20-minute breaks between each soak. 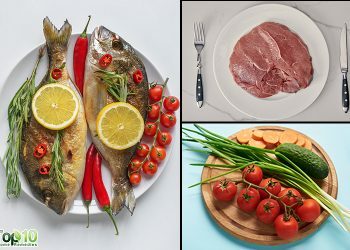 Be careful not to use too much heat, as it will only worsen the condition. 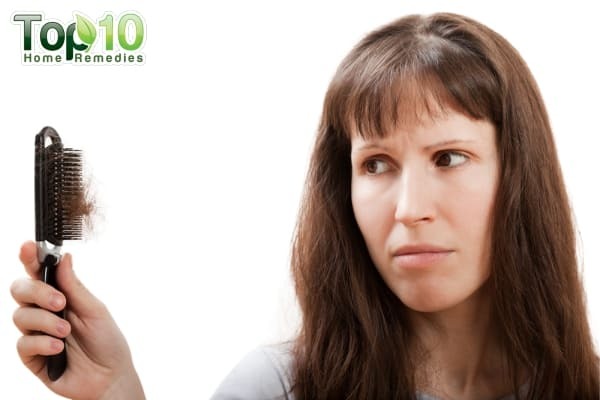 Also, avoid rubbing or wiping the area and watch for the formation of blisters or skin lesions. To reduce numbness in your hands and feet due to frostbite, elevation will also help. Elevation helps improve blood circulation. Once the flow of blood to the affected area gets back to normal, the numbness will vanish. You can place your frostbitten hands and legs on a few pillows to keep them elevated. If your nose or ears are affected, sit in a high-backed chair and bend your neck backwards. You can also wrap yourself with a warm blanket and drink a glass of hot chocolate or a cup of warm herbal tea to help your body adapt to warm temperature. For superficial frostbite that has been re-warmed, you can use aloe vera to help the skin heal. It has anti-inflammatory as well as healing properties that help soothe inflammation, reduce pain and eliminate other discomforts. 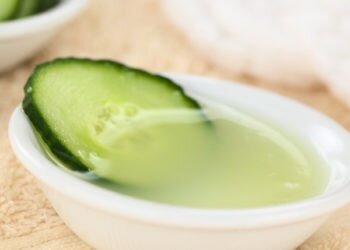 Aloe vera also helps prevent further skin damage and promotes tissue healing. A 1995 study reports that both pentoxifylline and aloe vera cream are effective in improving tissue survival after a frostbite injury (2). Cut open an aloe vera leaf to extract its gel. Apply this gel on the affected areas. Allow it to dry on its own, then gently wipe it off with a wet tissue. Use this treatment 1 or 2 times daily until you see improvement. 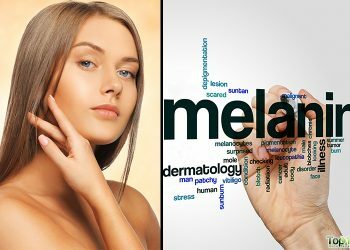 You can also apply an aloe vera cream on the affected area, a few times a day. A 2004 study published in the International Journal of Circumpolar Health reports that smokers are at a higher risk of developing frostbite (3). Smoking decreases peripheral circulation, and increases your resistance against the bad effects of extremely cold temperatures. So, it is better to stop smoking. 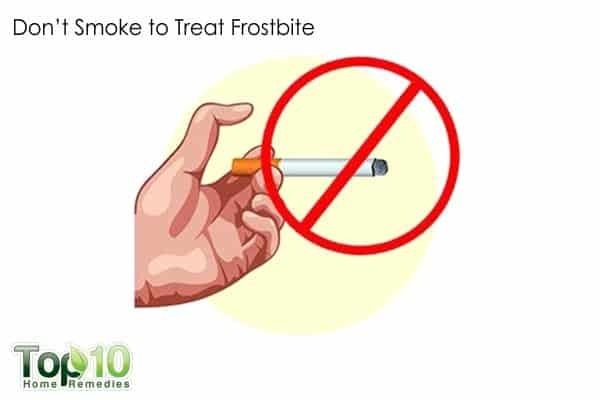 While the urge to smoke can be higher after suffering from frostbite, you must avoid it at any cost. Nicotine in cigarettes can reduce circulation in the body and lead to further complications. To keep your mind away from smoking, you can chew sugar-free gum. A whirlpool is a therapeutic bath in which all or part of the body is exposed to forceful whirling currents of hot water. Soaking in a whirlpool bath can aid healing of frostbitten areas by keeping the skin clean and naturally removing dead tissue, not to mention the benefit of combined heat and massage. Whether acute or chronic, whirlpool therapy is also great for reducing pain and stiffness, while at the same time increasing range of motion of the affected body part. Whirlpools are also beneficial in improving swelling and inflammation. It also helps dilate the blood vessels, thus promoting blood flow. Enjoy a whirlpool bath for 10 to 15 minutes at a time. Plus, drinking warm milk will help prevent dehydration and keep your body warm from within. 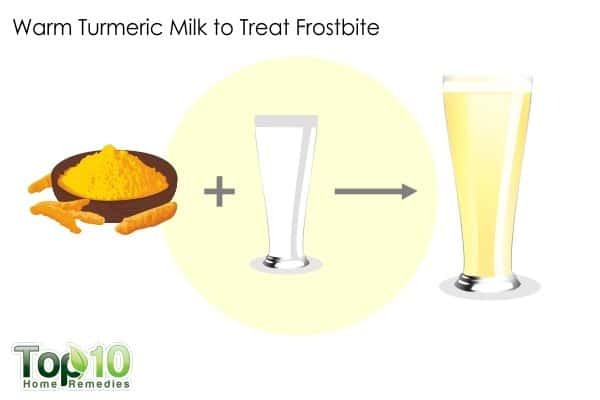 Add 1 teaspoon of turmeric powder to a cup of milk. Warm it up in a pan on low heat. Sweeten with a little honey. 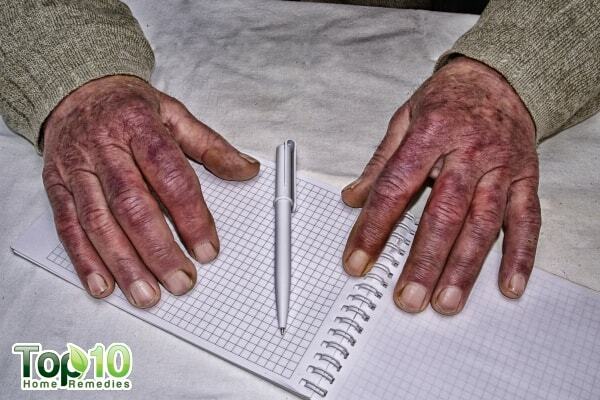 If you have poor circulation, you can take turmeric supplements daily. Consult your doctor before taking any supplement. 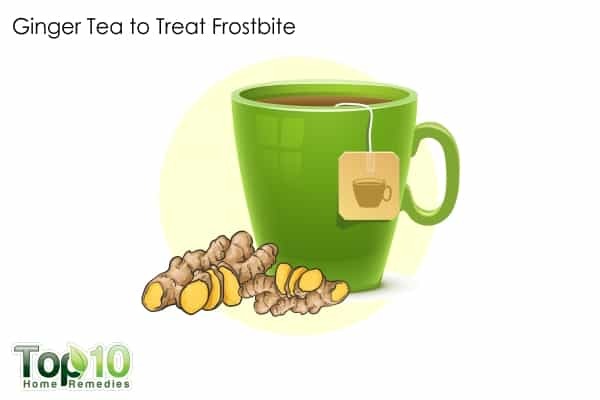 Ginger tea is really essential in treating frostbite. Ginger can help improve blood circulation. It contains compounds like gingerols and zingerone that have a warming effect on the body, resulting in good blood circulation. Add 1 tablespoon of thinly sliced ginger to 2 cups of water. Boil and then let it simmer for 5 to 10 minutes. Strain it, add honey and drink it. Cayenne pepper contains capsaicin that helps stimulate the proper flow of blood throughout the body and organs. Proper blood flow to the affected area is an important step in frostbite treatment. 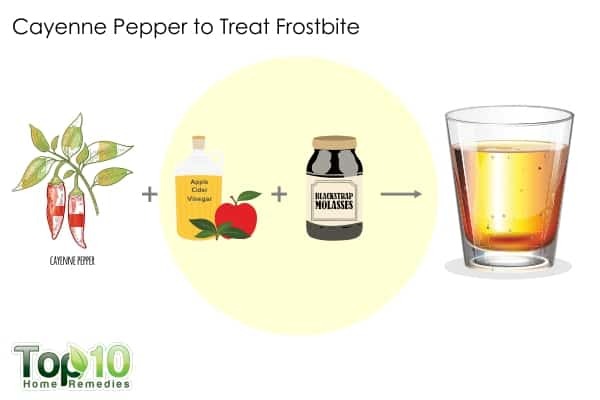 Plus, cayenne pepper helps reduce symptoms of frostbite like pain, inflammation, numbness and tingling sensations in the affected areas. Mix ½ teaspoon of cayenne pepper powder, 2 tablespoons of organic apple cider vinegar and 1 tablespoon of blackstrap molasses in 1 cup of water. Drink this mixture twice daily. Also, include cayenne pepper in your cooking, or take a supplement after consulting your doctor. Wearing the right clothes when going out in cold and windy weather can help a lot in preventing frostbite. Choose mittens instead of gloves to protect your hands and fingers from frostbite. Wear many thin layers of clothing rather than one or two thick ones, so that if the upper layer of clothes gets wet, you can remove it and remain dry. Try to keep your clothes dry, especially your socks and gloves or mittens. You should carry spare socks, gloves and mittens. Wear a hat and/or ski mask to protect your ears and nose from direct exposure to cold. Heavy woolen or windproof materials make the best headwear for cold protection. Wear windproof and waterproof outer garments to protect against wind, snow and rain. Choose undergarments that wick moisture away from your skin. You can even try hand and foot warmers. Be sure the foot warmers don’t make your boots too tight, restricting blood flow. Get emergency medical help if you suspect hypothermia. Don’t rub the affected area and never rub snow on frostbitten skin. It will only further damage the skin. Be sure to wrap children up with extra layers and bring them inside every hour to warm up. Children are more susceptible to frostbite, as they lose heat much faster than adults. Seek shelter immediately if encountering a serious storm. Don’t re-warm frostbitten skin with direct heat, such as a stove, heat lamp, fireplace or heating pad. These can cause burns. Choose insulating mittens or gloves and don’t take them off to use your phone. When going out in the snow, wear warm, waterproof boots that cover your ankles. 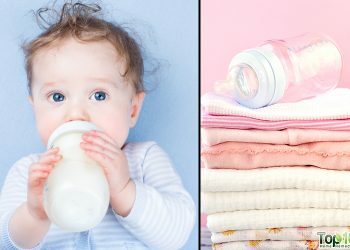 Remove wet clothing, either from snow or sweating, as soon as possible as it makes you more likely to get frostbite. Resist the urge to place cold hands or feet in a tub of hot water. If they are at all numb, you may not be able to feel if the water is too hot. An aspirin or other blood-thinner medicine may help restore blood flow in body parts with severe frostbite, if you take them within 24 hours of re-warming the area. However, it is recommended to consult a doctor first. Don’t drink alcohol if you plan to be outdoors in cold weather. Alcoholic beverages cause your body to lose heat faster. Frostbite. Baylor University Medical Center Proceedings. https://www.ncbi.nlm.nih.gov/pmc/articles/PMC2900980. Published July 2010. Treatment of experimental frostbite with pentoxifylline and aloe vera cream. Archives of Otolaryngology–Head & Neck Surgery. https://www.ncbi.nlm.nih.gov/pubmed/7772322. Published June 1995. The occurrence of frostbite and its risk factors in young men. International Journal of Circumpolar Health. https://www.ncbi.nlm.nih.gov/pubmed/15139242. Published March 2004.